Right so this is where things start to change quite a bit between these two boxes, and I’ll explain best I can. The box at my mother’s house, now known was MUFFHOST04, or MUFF04, needs to have pfsense running on it as well as FreeNAS. I can create a ptp link using DDWRT (what she has right now) but I would much prefer pfsense as I am certain of its performance and reliability. I will be setting up pfsense at my house and then simply plugging it all in offsite which poses some configuration hurdles. 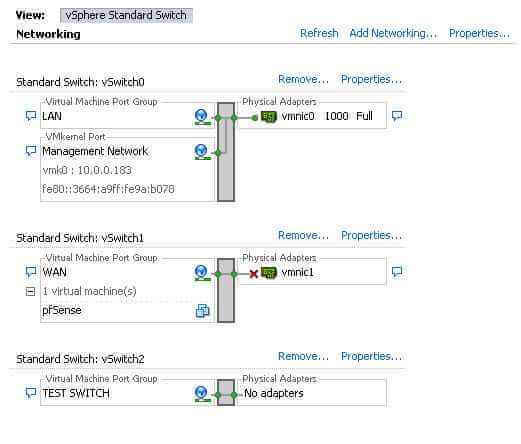 Setup networking in ESXI, 1 vSwitch with 2nd nic attached for WAN, rename current “vm network” to LAN, this will be LAN network of pfsense. Setup 2nd vSwitch called “TEST”, this will be where the machines reside and ‘speak’ outside my network (you’ll see), no nic attached here. Setup VM for management and testing, Windows Server 2008 R2 is nice, installs fast and I just like it. This will be setup with it’s nic on “LAN” during it’s setup. 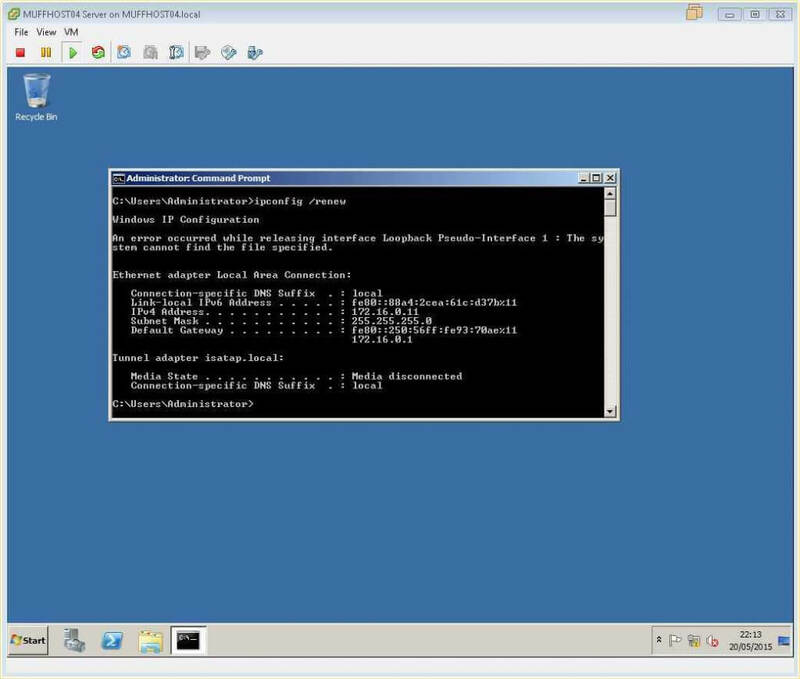 Once the Server 2008 has been setup, change it’s nic from LAN to TEST. Install pfsense with 2 nics, nic1 (em0) will be WAN and nic2 (em1) will be TEST. 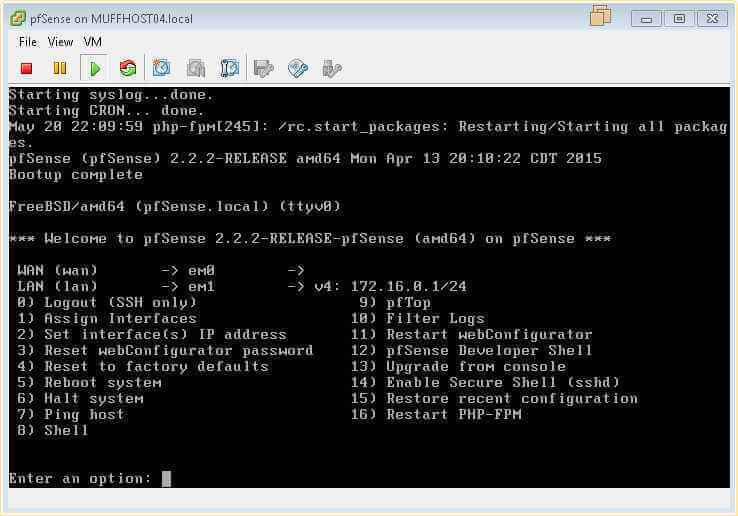 Change IP of pfsense through the console then continue to configure throught he management VM. Hopefully that made some sense to some of you. The TEST network is setup so I can operate in an enclosed environment where my network cannot interfere with anything and I can setup things such as DHCP ect. If this doesn’t make sense to you just continue and you should catch on. I’m not going to go through any of this in great detail as none of it is particularly hard, ill add enough so you can see what’s going on and where my mind is. The networking. MUFF04 is the host that requires the networking setup, MUFF03 just needs connection to the iLO port and nic1 into my main switch where it get’s VLANs piped down to it, so that’s a non issue. Great, we I have nic1 set as the LAN under vSwitch0, nic2 set as the WAN under vSwitch1 and my TEST network with no nic under vSwitch2. This is steps 1 and 2 complete under my rough plan complete. I’ve given it 2GB of memory here simply for the installation phase, I will drop this down to 1GB once it’s setup as all I will be using is the web browser. I have put it on the LAN network as I have a WDS server setup on my network so I went ahead and installed server 2008 R2 from the network, configured the essentials (RDP on, disable firewall, turn off motherfucking IE enhanced security, install VMWare tools) and then changed the spec to 1GB and put it in the TEST network. To be quite honest the machine works fine on 1GB and for what I’m using it for requires no more. Installing pfSense. This step is also very easy and is detailed very well here. I’m not even going to bother explaining anything because the folkes over at pfSense, like everything they do, have done an excellent job of explaining everything one would need to know about a virtual instance of pfSense. 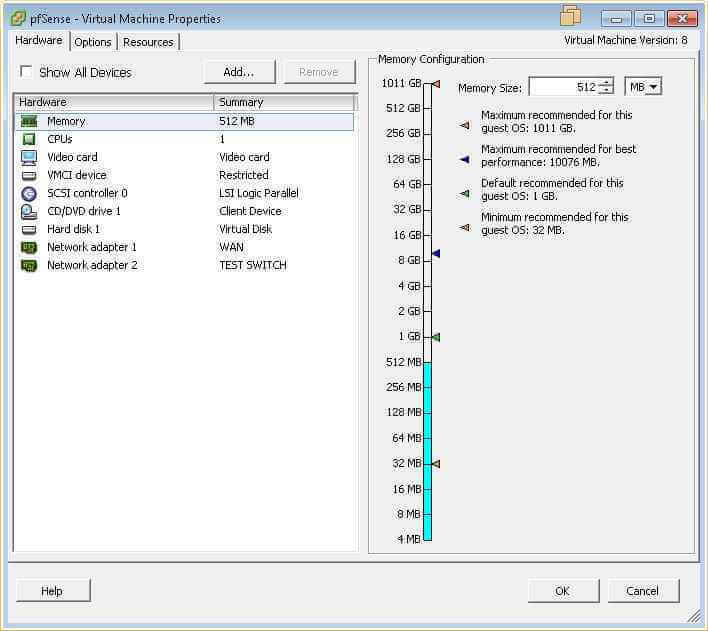 Just remember that there now is no longer a first setup dialogue with EM nics, meaning the first nic on the virtual machine (nic1, em0) is assigned to WAN. 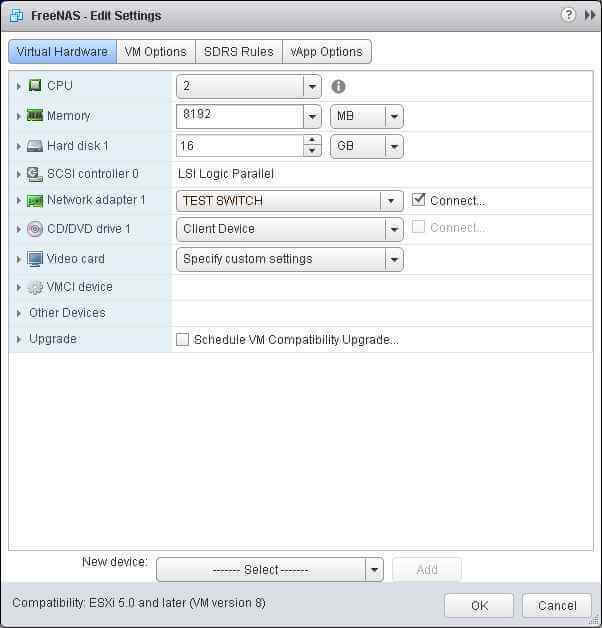 Ensure that the first nic in the settings is WAN, followed by, for me, TEST. Install pfSense following the guide I linked and when you bootup you will get the console screen with the settings you can configure. I went ahead and set the em1 interface with an IP of 172.16.0.1 and turned DHCP on. Now that’s all happy I console into the Server VM I created and do an IPCONFIG /RENEW, and I get an IP from pfSense! Now I use IE inside the VM to configure pfSense by going to 172.16.0.1, again I won’t go through the pfSense setup but it’s very easy. Now we have pfSense setup (minus the PTP link) I can move along with the FreeNAS install and setup. FreeNAS install is a walk in the park, which I won’t go through. Make sure to give it 2 vCPUs and at least 8GB of memory as well as 16GB of install space and to ensure that the OS is set for “FreeBSD x64”. 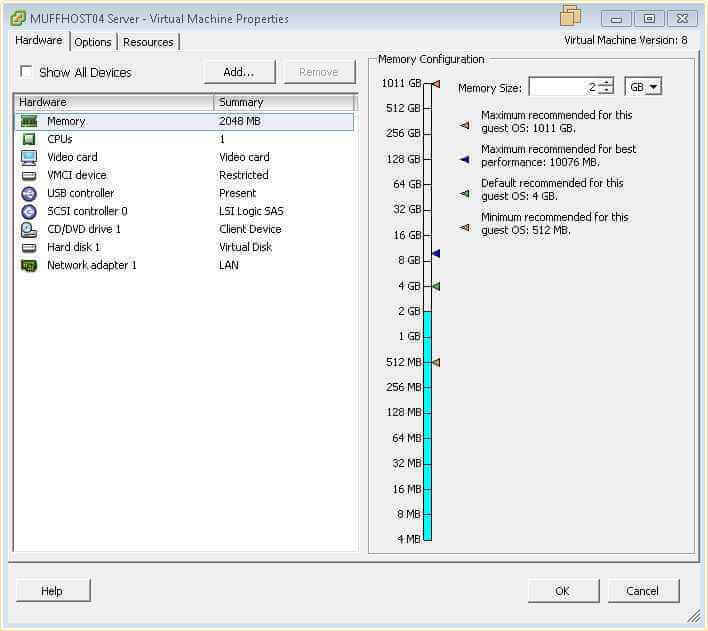 This is also where you would add a PCI device if you are using passthrough and passthrough the storage controller. This box will use passthough but my CPU has yet to arrive so I will do this at a later time. 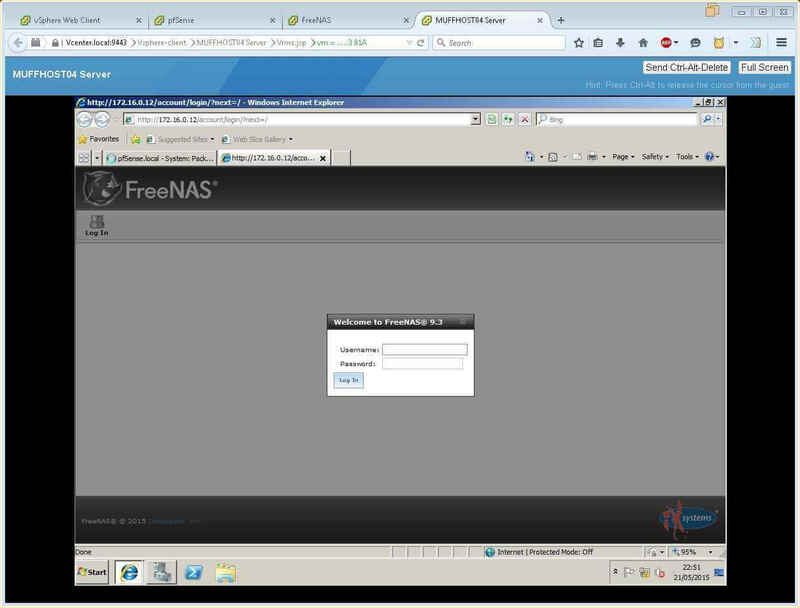 Entering 172.16.0.12 into my management VMs web browser and FreeNAS shows up, success! MUFF04 is now ready for storage! MUFF03 will get FreeNAS installed but it will only be running FreeNAS, and the network will go straight into my LAN on the appropriate VLAN so there won’t be this lengthly setup. Onwards to storage setup we go…. Me he comprado un microserver gen8 de HP hace poco y lo estoy configurando poco a poco cuando tengo algo de tiempo libre. Simplemente quería escribir para decirte/decirles que el blog está espectacular y que me alegro de haberlo encontrado! cosas como esta hacen falta. Muchas gracias por compartir el conocimiento! hey! just realized I wrote supper fast from my workplace and I did in Spanish 🙂 all I wanted to say is that I find this blog extremelly helpful for everyone that has this type of server. I’m glad I found this blog. Thanks for sharing your knowledge! Cheers!